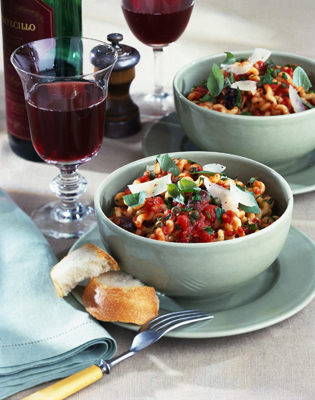 This classic Italian pasta dish is quick and easy to make and is delightfully spicy. Pasta Puttanesca can be garnished with shaved Parmesan cheese, which you also can use over vegetables, salads, and other pasta dishes that have an Italian or southern French flair. Heat the olive oil in a large skillet over medium heat. Add the anchovies and cook, stirring, about 1 minute. Add the garlic and crushed red pepper flakes and cook for 1 minute. Stir in the olives, capers, tomatoes, and 2 tablespoons of the parsley. Simmer the sauce for 15 to 20 minutes. Meanwhile, cook the pasta according to the package directions in a large pot of lightly salted boiling water. Drain the pasta in a colander. Add the remaining parsley and basil to the sauce. Add the pasta and toss well. Capers, the bud of a bush native to the Mediterranean and Asia, are usually sold packed in brine. Before using, rinse them in a strainer under running water to remove the excess salt. Per serving: Calories 420 (From Fat 92); Fat 10g (Saturated 1g); Cholesterol 1mg; Sodium 580mg; Carbohydrate 70g (Dietary Fiber 6g); Protein 13g.